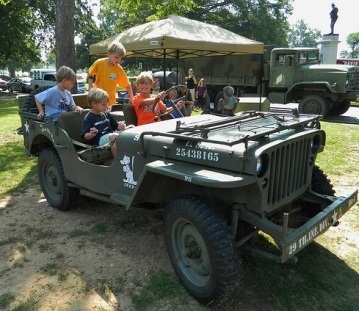 The MacArthur Museum of Arkansas Military History will host its third annual vintage military vehicle show on Saturday, July 25, from 9:00 a.m. to 2:00 p.m.
Two dozen military vehicles from World War II through Desert Storm will be on display in front of the museum, located at 503 E. 9th Street in downtown Little Rock’s MacArthur Park. The vehicle show will feature Jeeps and other vehicles from the Arkansas Military Vehicle Preservation Association and the West Tennessee Military Vehicle Collectors Club. Any vehicle may be displayed, so long as it was used by the military in the past. The show appeals to those who have an interest in military history, as well as in vintage cars and trucks. It is free to the public. Local vendors, with items for sale, will include Bennett’s Military Supplies, Loblolly Creamery, Southern Salt Food Company, and East Ninth Vintage. Tonight from 5pm to 8pm Historic Arkansas Museum will host the 10th Ever Nog-off. And it’s free! Get in the holiday spirit with some holiday spirits at this celebration of a favorite holiday drink. Sample a variety of nogs and vote for your favorite at this friendly competition for the best nog in town. Noggers include Cache Restaurant, Capital Bar and Grill, Copper Grill, the Empress of Little Rock, Loblolly Creamery, Bridget Fennel Farris, John Selig and Family, and Stone’s Throw Brewery. The judges will be Mayor Mark Stodola; attorney and cocktail expert Joel DiPippa; and Emily Van Zandt, food and drink editor of Arkansas Life. There is no doubt that Little Rock’s cultural scene is brightened by the explosion in culinary artists over the past decade or so. Many of these talented chefs, farmers and foodies are often partnering with museums, theatres, galleries and concert venues to promote healthy eating and an enhanced culinary experience. Saturday, September 13, there is another example of this. This time they are partnered with not only a historic structure, but with an outreach program to promote healthier habits. 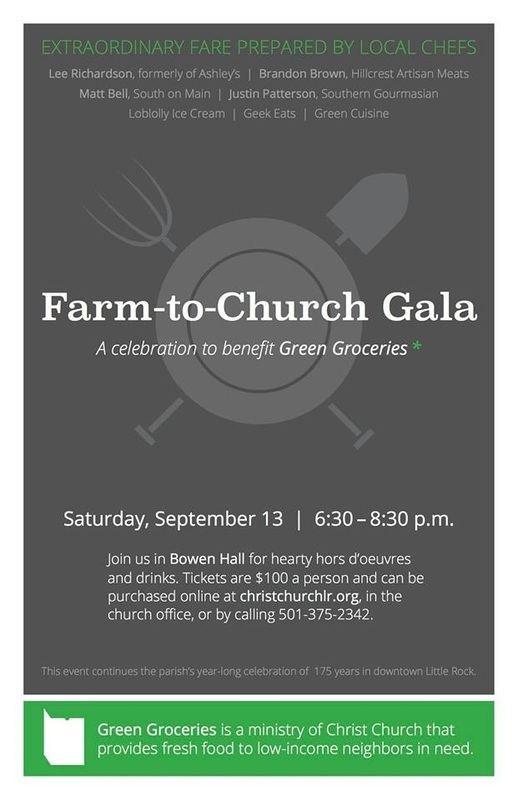 As part of its year-long celebration of 175 years in downtown Little Rock, Christ Church is hosting a fundraising gala benefiting one of its newest ministries. Green Groceries is a Christ Church fresh food ministry serving low-income neighbors in need. The event will feature extraordinary fare prepared by renowned chefs Lee Richardson, formerly of Ashley’s; Matt Bell, South on Main; Brandon Brown, Hillcrest Artisan Meats; and Justin Patterson, Southern Gourmasian. In addition there will be offerings from Loblolly Ice Cream, Green Cuisine, Geek Eats, and Rock Town Distillery. 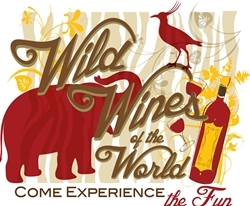 The Little Rock Zoo is closing early today so that it can finalize the set-up for Wild Wines of the World – the annual fund raising event of the Arkansas Zoological Foundation sponsored by Wright, Lindsey and Jennings, LLP. The event, now in its eighth year, has more than doubled the number of participating restaurants from last year’s event, making it one of the largest culinary experiences in central Arkansas. Food donated by central Arkansas’s best restaurants and food establishments will be paired with wine donated by O’Looney’s Wine & Liquor at uniquely themed stops set-up along designated paths all around the Zoo. This year’s theme for the event is “All Aboard” in honor of the Zoo Foundation’s effort to raise funds for a new Zoo train. All proceeds from the event will go toward the purchase of a new train scheduled to arrive at the Zoo on Memorial Day weekend. The wine and culinary trip begins at 6:00 p.m. in Café Africa in the Reserve Wine Room with food from Cache Restaurant where executive chef Matt Cooper will be on hand with O’Looney’s store owner and certified wine expert Jonathan Looney, who will discuss wine and food pairings with patrons of the event. The main event opens at 7:00 p.m. with food and beverages served from 56 tables in 14 uniquely themed areas. Highlights of the event include the Hiland Dairy Cooking Team with members of the Coleman family cooking fresh steak and shrimp for guests, and Arkansas Craft Beer serving-up samples of local brew. Loblolly Creamery will be serving “winesicles,” and Scallions will serve their famous cheese soup. IHOP will be cooking fresh French crepes, and Flying Saucer will serve soft pretzels with spicy mustard. This is just a taste of what guests can expect at Wild Wines this year! Tickets are only $65 per person for the general event and $100 per person for the Reserve Room and may be purchased online at LittleRockZoo.com/wildwines or by calling (501) 666-2406. Tickets will be sold at the door while they last, but Reserve Room tickets typically sell-out well in advance. The Little Rock Zoo is accredited by the Association of Zoos and Aquariums. Look for the AZA logo whenever you visit a zoo or aquarium as your assurance that you are supporting a facility dedicated to providing excellent care for animals, a great experience for you and a better future for all living things. With its more than 200 accredited members, AZA is a leader in global wildlife conservation and your link to helping animals in their native habitats. For more information, visit http://www.aza.org. In conjunction with the 2nd Friday Art Night, Historic Arkansas Museum presents its 8th Ever Nog-Off tonight. It takes place from 5pm to 8pm at HAM and is free. What started as a friendly competitive conversation between members of two of Little Rock’s oldest families about Egg Nog recipies has turned into an annual holiday celebration. Historic Arkansas Museum’s 8th Ever Nog-off is a culinary celebration of this favorite holiday drink, and friendly competition for the best eggnog in town. From a 185-year-old recipe handed down 7 generations to concoctions with a modern twist, the only way to determine a winner is for guests to sample them all. Two awards are given with the prize being bragging rights. The People’s Choice goes to the eggnog that receives the most votes from the Nog-off’s discerning guests who have chosen winners astutely for the past seven years. The Taster’s Choice goes to the nog that gets the nod from celebrity tasters. After sipping Egg Nog, participants can visit any of the numerous other sites of this month’s 2nd Friday Art Night throughout downtown.